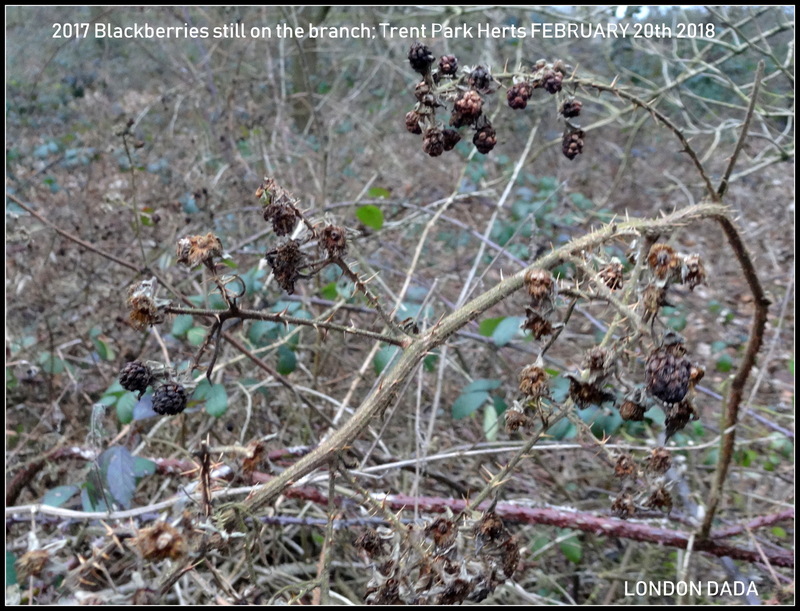 This years crop of blackberries are not only holding onto the branch again late into the autumn, but many are turning red, that would indicate deep snow on the ground for long periods this coming winter, as Nature’s emergency larder provision for birds and other wildlife. The colour red stands out more strikingly than dark dots more especially against blankets of snow and makes it easier for birds especially to spot from above. In the light of our success in predicting the Beast from the East in early 2018 ( see below ) who would bet against a very snowy winter this time around? Not our friends at the Met Office, surely! 😉 ? ( nature forearming is human society forewarned ). London Dada vs. Met Office challenge. 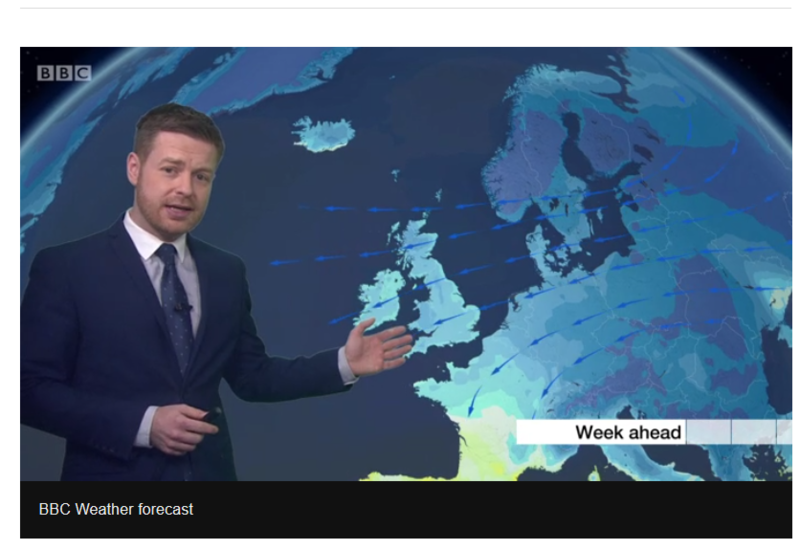 Thomasz Schafernaker, our friend from the Met Office catching up with Nature. ” You are funny 🙂 ” Thomasz’s Twitter comment on our BFTE forecast in December 2017. 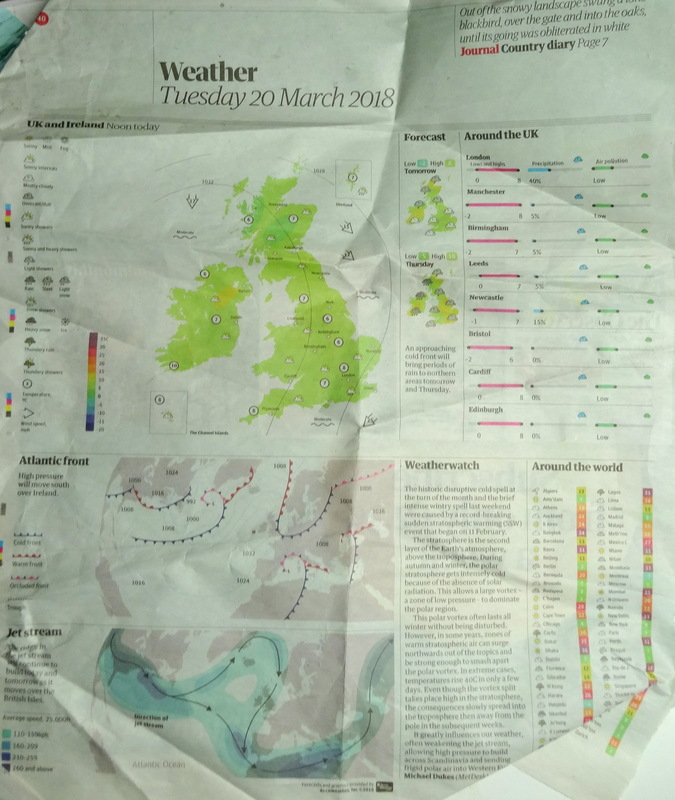 ” Historic disruptive cold spell “ Record-Breaking” – words that Michael Dukes ( MetDesk @ the Guardian ) used on March 20th 2018, to describe the freakishly cold spells, or “Beast From the East” 1, 2 & now Easter predicted 3. 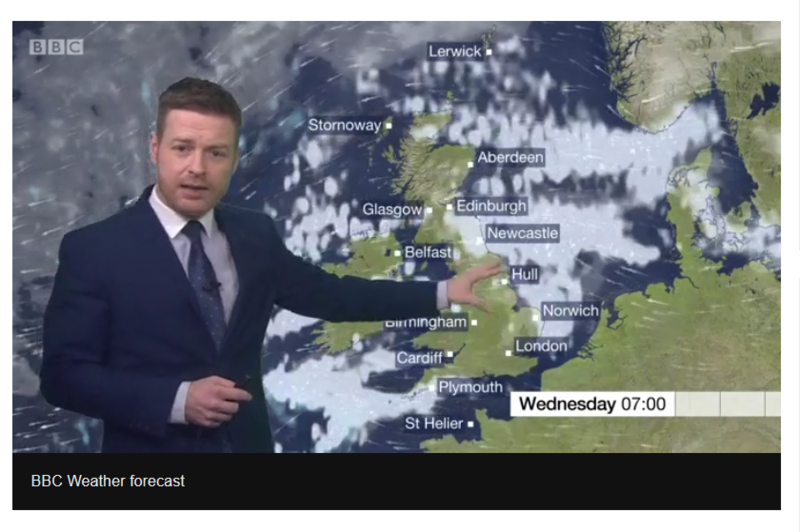 Absolutely no hint of this in the Met Office’s own Long Range winter forecast back in November 2017 ( see above ), but which, as artist Michael St.Mark observed, Nature herself certainly did. 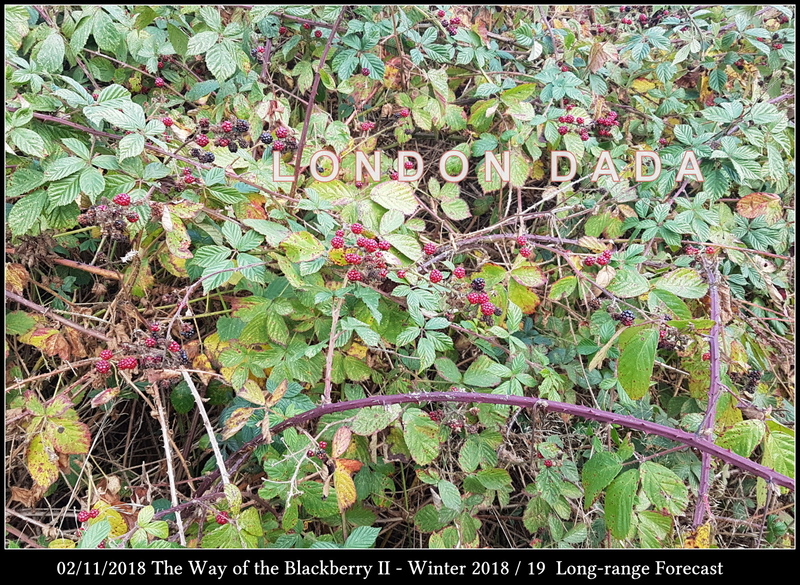 VALIDATION of LONDON DADA’s severe cold prediction based on last year’s Autumn berries extremely unusually, if not uniquely, lingering on the branch well into January and beyond as Nature’s own emergency food reserve preparation to aid bird survival during the extreme cold she saw coming. 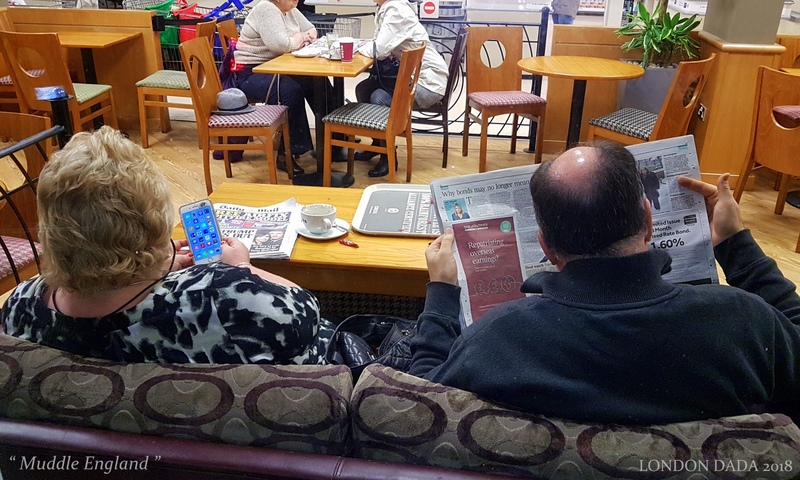 Tesco in-store Costa coffee lounge scene, January 2018; the ageing Middle England couples’ dreams of riches and quality of life through share investments and steadfast support of the nation-wrecking Tories still evident through habitual perusal of the right-wing tabloid press. Real life archetypes of those millions who kept Thatcher govt. in power throughout the 1980s on the promise of cheaper bread. ” Well folks, after over 12 years we’ve almost arrived at the millenium milestone of photo-oriented artorks focussed on resuscitating and revitalizing the Dada art movement along lines originally intended by its founding father, Hugo Ball…. Achievements to date include pointing and trending art as relevant to current times by reflecting social issues and street reality of life in the UK today and as amazingly confirmed and admitted in 2017 by Maria Balshaw as new director of Tate Modern. After 10 years of annual campaigning, unsupported by other artists or institutions; succeeding in pressuring/shaming Tate directors into lifting the blatantly ageist Turner Prize under-50 age limit for entrants. Wolff Olins’ London 2012 Olympic brand logo and Wilkinson Eyre architects’ basketball arena design on the Olympic Park, plagiarised both in form and concept artist Michael St.Mark’s pre-existing Infinitude II bas-relief work. 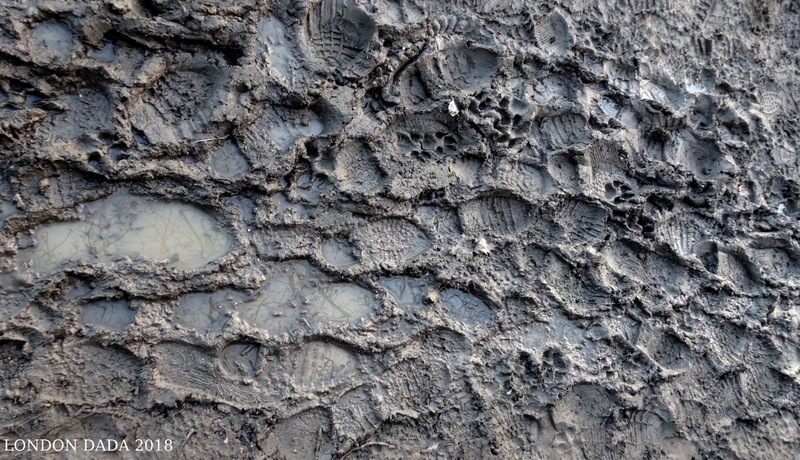 …when parks become bog traps for all but intepid trawlermen in thigh-high waders..and your dogs behaving like seal pups by pretending they’re one step backward in evolution again.